This conference proceedings volume contains survey and research articles on topics of current interest written by leading international experts. The topic of the symposium was 'Interactions of Algebraic Geometry, Hodge Theory, and Logarithmic Geometry from the Viewpoint of Degenerations'. The book contains four surveys on pencils of algebraic curves by T. Ashikaga and K. Konno; integral $p$-adic Hodge theory by C. Breuil; Hodge-Arakelov theory of elliptic curves by S. Mochizuki; and refined cycle maps by S. Saito.Also included are two results by Gabber on absolute purity theorem written by K. Fujiwara and research articles on the Picard-Lefschetz formula by L. Illusie, moduli spaces of rational elliptic surfaces by G. Heckman and E. Looijenga, moduli of curves of genus 4 by S. Kondo, and logarithmic Hodge theory by K. Kato, C. Nakayama, and S. Usui and its application to geometry by S. Saito. 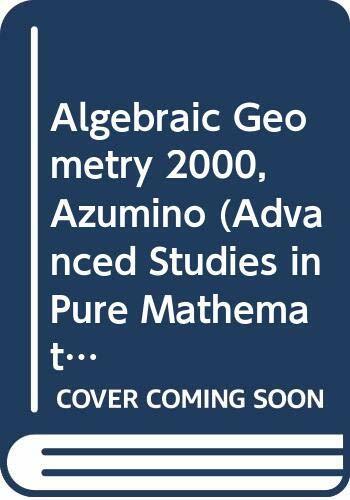 The volume is intended for researchers interested in algebraic geometry, particularly in the study of families of algebraic varieties and Hodge structures.